Are you comfortable working in a team ? Home HR Interview Questions and Answers Are you comfortable working in a team ? The best way to answer this question is “yes”. You can explain some of the examples where you have worked in a team and made it a great success. 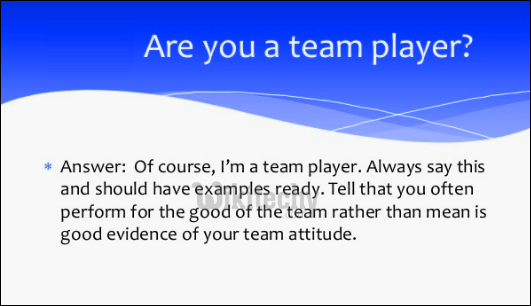 Make sure that your answer is in such a way that the interviewer really gets your are a best team worker and you are also capable to guide and support your team members too. Yes I am comfortable working in a team because I think teamwork leads to increased productivity and performance. Groups that have a good synergy can achieve more than employees working on their own. Teamwork brings together people with a broad range of skills and allows me to develop my understanding of a particular challenge. Related Searches to Are you comfortable working in a team ?